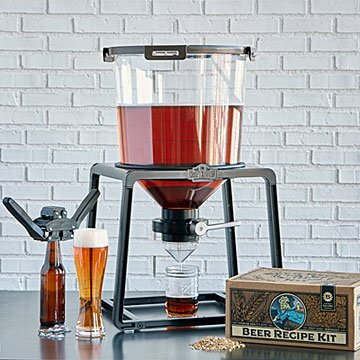 This kit comes with everything you need to get serious in your quest for the perfect home brew. Getting serious about your quest for the perfect home brew? This kit comes with everything you need to get started—quite a leg up if you don't know where to start. Armed with a durable fermentation system, thermometer, capping kit, and more, you can make five gallons of the beer of your choice, whether that's Oktoberfest Ale or West Coast IPA. More compact than traditional home-brewing kits, it even comes with a handy guide to brewing and fermenting, so you can be a yeast expert, too. Cheers to that! Assembled in Orlando, Florida. Oktoberfest: Inspired by traditional beers served during Oktoberfest, this malty ale has a light copper hue, subtle bitterness from its Perle and Mt. Hood hops, caramel sweetness, and a clean, dry finish. West Coast IPA: This IPA offers a delightfully crisp and complex hop profile with citrus, floral, and spicy notes. I'm already planning on buying another Catalyst! I brew on average once every month or so. I really enjoy it. I've made close to 15 different beers with the Catalyst, and started with their kit. I can't say enough about these guys! Great quality, good price. Very easy to setup, easy to wash, easy to use. I upgraded to a larger mason jar for my VERY HOPPY Beers! Buy one! You'll love it. Considering a second one to brew more at once! I've been brewing for a few years when I found the Catalyst. Since racking the beer (siphoning) between buckets and carboys always drove me a little nuts, I would put off doing it. (I think it was the sanitizing the siphon that got me.) But with the Catalyst, it's quick and easy to pull the trub away from the beer (instead of siphoning the beer off the trub). The best, easiest, most authentic home brew!! Love this product, it's incredibly easy to sanitize and use. The design makes single vessel brewing easy, no need to rack your brew. The look is fantastic, great conversation piece. For the beginning to the end the ease of use and clean up is MUCH easier than the conventional models. I used this catalyst for brewing any kind of ale beer. feit perfect in my apartment. easy to use. easy to clean and fun to use. haven't made a bad beer out of it yet.